Vezi Acum Guilty Crown S01E08 - Courtship Behavior Online Subtitrat in romana calitate HD. Guilty Crown S01E08 - Courtship Behavior este un episod lansat pe 7 ianuarie 2013 super! Vezi acum online gratuit! 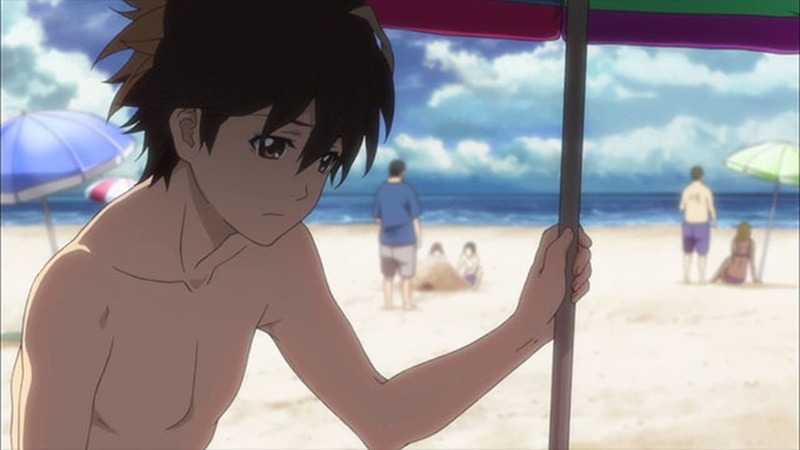 Shu is going with Inori, Hare, Souta and Kanon on a beach retreat at Oshima which his mother tells him to also visit his father's grave. In truth, the retreat is actually a mission for the Undertakers to get Souta there so they can use his Void to enter a secret GHQ facility located at a shrine and steal a special item. As Shu and his friends have fun on the beach, Gai and the rest of the Undertakers monitor them. As Shu pays respects to his father, Kurosu Ouma, an expert on the Apocalypse Virus who he died during the "Lost Christmas" incident ten years ago, Gai suggest to Shu to use Souta's crush on Inori to get him alone so they can get his Void much to Shu's dislike. That night, Souta is alone with Inori and is about to confess to her but is stopped by Shu who immediately pulls out his Void and much to Shu's embarrassment, the Undertakers were watching him with Ayase and Tsugumi wondering what he was about to say about his relationship with Inori. As Gai, Inori and Shu enter the facility using Souta's Void, a camera that takes pictures of doors and opens them, they find too late to discovered the item, a canister containing the origin of the Apocalypse Virus, has been taken by Shuichiro earlier and cancel the mission. The next morning, Shu and Souta makes amends on their relationship and their hardship of understanding each other. As everyone leaves Oshima, Inori explains to Shu how people's Voids change based on his relationship with them. Distribuie sau scrie parerea ta despre episodul Guilty Crown S01E08 - Courtship Behavior.